confession: i never put my handbags on the floor or ground if i'm out and about. in NYC, sitting in crowded restaurants or cafes often means that there's no space to sit comfortably and still stash my bag on a not-gross surface. to the rescue: the simple yet super practical handbag hook. this would totally come in handy for travel too – and it works as an insta-hook to securely hang your handbag in the worst place to be without a handbag hook: public restroom stalls. there are many versions of this (often referred to as 'purse hooks'). unfortunately the majority seems to be of the weirdly bedazzled/tacky/cheap-looking variety. i was so happy when i found mine that i promptly bought some for friends (this actually might be the perfect little gift for girlfriends and moms!). it's inexpensive, metal, securely hinged, sleek, well constructed, and definitely holds a substantially heavy bag securely (the little gel pads at the hook ends keep things stable and don't scratch surfaces). what do you think? do you run into this issue? I have 2 purse hooks that I received as gifts but rarely use them. I always just end up having my bag on a chair or right behind me on the chair I'm sitting! I really should use those purse hooks! Yours is a nifty ingenius hack! Such a great idea! I was just thinking about that yesterday when I was hanging out with some friends at a beer hall in the village, mainly that "sometimes I wish NYC wasn't so crowded and kind of gross, my poor purse, I'm so sorry, but you're sitting under my chair on the floor again..." I have to send it to go get cleaned, but first I need to get one of these! indeed! i think some people also say that it's bad luck to put your handbag on the ground. either way, it's just more secure when it's hanging right where you're sitting! What an excellent gadget. I used to go to a bar where they had bag hooks under the table and I always thought that was such a simple but effective idea. Enough for me to always remember it. Just thinking about it, I'm not sure it would stand up to the weight of my bag these days - these boys toys are heavy! Sue - i know there will be some people who will roll their eyes but it really is super handy. it's rather difficult to 'clean' leather anyway, so this is perfect in my book. also i think this one can hold up to 45 lbs. it's a lot stronger (with laws of physics and all that) than you'd think! i've been curious and skeptical about these things, i always wondered how it was possible for that tiny thing to hold the weight of a purse. you can tell i've never taken a physics class a day in my life! I've heard about this years ago but it never interested me. I don't think I've ever worried or even thought twice about where my purse would go while I'm at a restaurant. plus, the ones I did see had the ugliest bejeweled, butterfly-like design. I like the clean design of the one you posted. just from the aesthetic alone, I think I would buy one if the need was necessary. I've never used one of these before, as I generally just sit my handbag on my lap or table if I can, but I definitely think it's a great concept. I like the simple design of this one though! I've never used one of these handy little bits before but they were SO popular many years ago and I was even helping a friend launch a line of them. Never see anyone using one for some reason and always wondered the stability of them. I'm a bit of a snob about putting my bag on the dirty floors of NY haha, so if you are vouching for it holding heavy bags, maybe I'll finally give it a whirl! I used to pop the purse hooks into my bag until I found out that if I'm not careful enough, it may leave a dent on the handle. My former colleague was one of those women who is prepared with anything and everything you could ever need. 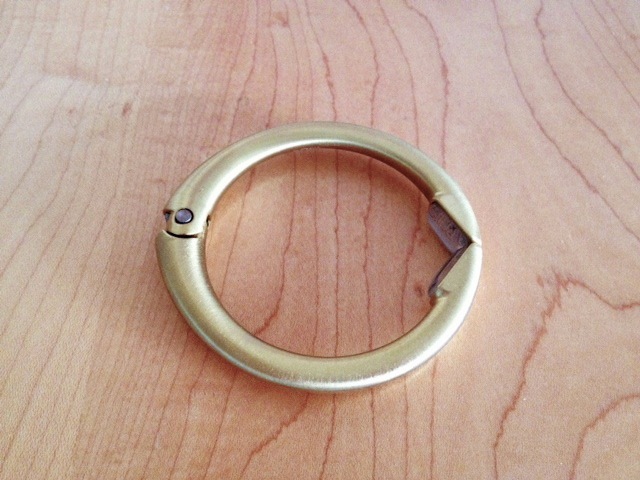 A few years ago she purchased all of us purse hooks from the MOMA Design store- really smart design and minimalist. Sitting bags down freaks me out. You always see those health reports where the bottom of purchases has all types of bacteria on them. Yuck. Living in New York, these are essentially. But I haven't found one that I could actually bring in public with a straight face. This is perfect!